ElectronicKitSchool. - This is one of the best electronic project design software to create electronic circuit design and PCB layout design manually and auto-route for you this time which very useful which called with Protel Advanced PCB. Although this software categorized as the old software, but we think it is still suitable for you. 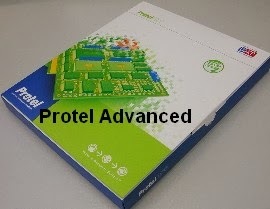 In this time we will give you global description about this Protel Advanced PCB software that and then the last we will give you the link to take free download Protel Advanced PCB Version 2.8 for Windows from external software. From the Eltronicschool.com describe that that globally Protel software using to design electronic circuit schematic and also continue to design PCB layout manually and also Auto-Route according the electronic circuit schematic that we design. So this software will very useful to you who want to do your electronic job. Can run in Windows operating system that more widely used. Having auto route facilities that can make layout PCB automatically. Although it complexity, but it also easy to use because the main menu is represented by using the bottom. Can be used to design a Multi-layer PCB (consisting of several layers.) In this case it can handle the manufacture of PCB layout with the difficulty level of the complex. And now you can click the icon link below to continue download Protel Advanced PCB Version 2.8 for Windows from external source.